What Is The Generic Name For Duolin Inhaler (50 Mcg+20 Mcg)? Which US Brand is Equivalent To Duolin Inhaler (50 Mcg + 20 Mcg) (Levosalbutamol+Ipratropium)? Duolin Inhaler contains active ingredients, Levosalbutamol (50 mcg) and Ipratropium (20 mcg), used in the treatment of Asthma, Allergic Conditions and Chronic Obstructive Pulmonary Disorder. You may find it at all the leading pharmacy stores, drugstores and medical supply stores and can be given by doctor’s prescription only. Cipla (India) is one of the top leading pharmaceutical companies which manufacture Levosalbutamol + Ipratropium. 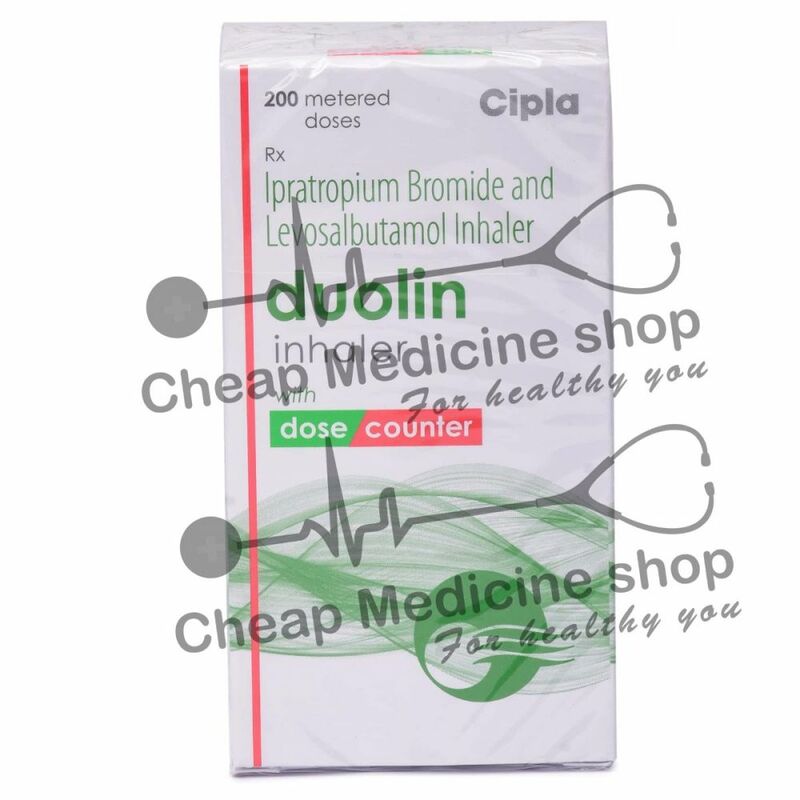 Duolin Inhaler contains active ingredients, Levosalbutamol (50 mcg) and Ipratropium (20 mcg) which is available in the various strengths and substitutes at all the leading pharmacy stores, drugstores, and medical supply stores. What Are The Uses Of The Duolin Inhaler (50 Mcg + 50 Mcg) (Levosalbutamol+Ipratropium)? How Duolin Inhaler (50 Mcg + 50 Mcg) (Levosalbutamol+Ipratropium) Works? Levosalbutamol (a Beta2-adrenergic agonist) acts on airway smooth muscle resulting in muscle relaxation which prevents bronchoconstriction and makes breathing easier. Ipratropium (an anticholinergic) basically decreases the activity of acetylcholine in the lung which relaxes and opens the air passages to make breathing easier. What Should You Avoid While Taking Duolin Inhaler (50 Mcg + 20 Mcg) (Levosalbutamol+Ipratropium)? You should strictly avoid taking Medicines without prescriptions as these may react with Duolin Inhaler. When Not To Use Duolin Inhaler (50 Mcg + 50 Mcg) (Levosalbutamol+Ipratropium)? Have Allergic Conditions like Urticaria, Skin Allergy, Angioedema, etc. Duolin Inhaler contains active ingredients, Levosalbutamol (50 mcg) and Ipratropium (20 mcg), used in the treatment of Asthma and other Allergic Conditions. Inhalers are available in various strengths and substitutes and should be given on prescription only. You should always consult your doctor for the frequency of dose as age and severity of the disease differ in each person. Adults and Children are advised to take Duolin Inhaler at a fixed time, preferably suggested by the doctor. Do not take larger or smaller amounts than Prescribed. It should be used cautiously in pregnant and breastfeeding women. How Much Of The Duolin Inhaler (50 Mcg + 20 Mcg) (Levosalbutamol+Ipratropium) to Be Used? How To Take The Duolin Inhaler (50 Mcg + 20 Mcg) (Levosalbutamol+Ipratropium)? For How Long Should You Use Duolin Inhaler (50 Mcg + 20 Mcg) (Levosalbutamol+Ipratropium)? You are always advised to use Duolin Inhaler for as long as your doctor has prescribed. Contact your doctor immediately or rush to the nearby hospital for an emergency if you are suspecting an Overdose. A missed dose of Inhaler should be taken as soon as you remember. Skip the dose if it is the time for the next dose. Do not double the dose for next time if you missed once. What Are The Side Effects Of Duolin Inhaler (50 Mcg + 20 Mcg) (Levosalbutamol+Ipratropium)? Always consult your doctor to get the best possible treatment and dosage adjustment in medical conditions. Do not stop the medicine even if you feel better; let your doctor decide it. Monitor your Potassium Levels especially if you taking Diuretics, Aminophylline, Theophylline, Corticosteroids, etc. Regularly wipe the mouthpiece of Inhaler with a fiber-free tissue/cloth. Store the Duolin Inhaler at the cool temperature in dark and dry place. Do not refrigerate.